Adventure Sixty North is a small outdoor adventure center offering many types of trips and services year round here in Seward, Alaska. This company started out in 2004 with a dream to provide amazing adventures and services year round. We were the first and only guiding company to do winter guided tours and over the snow transports with our 12 passenger snow coach into the Kenai Fjords National Park. Our focus has always been providing quality services to remote and very dynamic destinations in Resurrection Bay and Kenai Fjords National Park. There is a reason that Adventure Sixty North has been asked to work with a ton of media productions - governmental agencies - educational entities, including the Discovery Channel, Weather Channel, and the Eisenhower War College. We have even assisted with the President Obama visit and more. We are here to provide guidance and services that are needed by our many outdoor adventurers that visitors to Seward, Alaska and the Kenai Fjords National Park year round. We love this pristine wilderness area so much that we choose to live here and play here! This is how we Roll! The size of an adult returning to spawn may measure up to 2.8 feet (86 cm) in length and weigh an average of 8 pounds (3.6 kg). 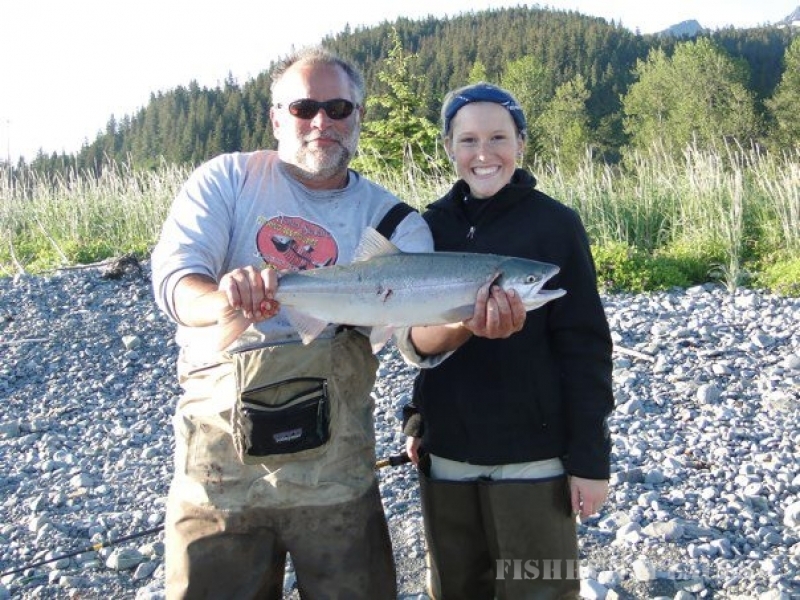 Wes will provide poles and gear needed to fish for this species of fish from one of our many locations where the salmon come in from the cold Alaskan waters of Resurrection Bay and guide you as you fish for sockey's that abound in this part of Alaska. He will walk you in to the local gathering areas that the fish group in before running up the rivers. Its a fun and exciting time for all age and experience levels. Times will vary according to tide times - The fishing definitely is better at the changing tides which happen 4 times a day. We have 2 highs and 2 low tides here in Seward.